You wait 13 years for an Aphex Twin record, and then two come along at once. 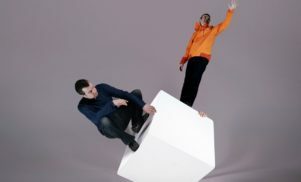 But Computer Controlled Acoustic Instruments Pt2, a 28-minute EP that appeared without warning in January this year, was far from a straight Syro sequel. Instead of clattery, hyper-proficient jazz-rave, these 13 tracks explored an eerie, unnatural domain of stiffly robotic breakbeats, ringing chimes and complex flurries of piano. If Syro’s limber, squelchy electronica sometimes felt almost organic, Computer Controlled Acoustic Instruments seemed to approach the notion of machine-human synthesis from the opposite route: sounding live in an ‘instruments recorded together, in a room’ sense, but undercut with a musicianship that felt oddly clinical and machine-like, shorn of the swing or vigor that flesh-and-blood musicians inevitably bring. Unique maybe, but the idea of removing the human presence from musical composition or performance is far from new. In fact, the fantasy of automated or mechanical music stretches far back into antiquity. Throughout the 20th century, outsider figures like Pierre Bastien have toiled at bizarre homemade contraptions that challenge conventional ideas of what music can, or should be. And while the advent of computing should perhaps have rendered such cranky nuts-and-bolts devices obsolete, such experiments by Aphex and his old compadre Tom Jenkinson, aka Squarepusher – whose 2014 EP Music For Robots consists of five pieces composed for the Japanese robot band Z-Machines – suggest this hinterland between the computerised and the mechanical is in fact an uncanny valley of creative opportunities. With this in mind, here we trace back the mechanical orchestra to its earliest origins, detail some of the eccentric minds that bring them to life, and ponder what place these curious creations might have in a digital age. The creators of mechanical orchestras and automated music devices are, as you might expect, an eccentric bunch, and there is no clear history or common thread to their evolution. Perhaps it makes sense, then, to go right back to the beginning. The earliest automated instrument on record is the hydraulic organ – a creation of the Banu Musa brothers, ninth century Persian inventors who lived and worked in Baghdad and sketched out a design in their illustrated work, Book Of Ingenious Devices. Early attempts at creating automated musical devices feel like examples of primitive programming. The mechanical carillon, found in the Low Countries as early as the 13th century, consisted of 23 or more bells designed to play in melody, “programmable” by large revolving cylinders studded with pins. A surviving example can be found today in the Ghent Belfort (see below). As craftsmanship improved, automated music devices got smaller and smaller. By the 19th century, Swiss watchmakers were producing elaborate disc or clockwork-powered music boxes and other curios, which varied in size between large, furniture-sized devices and those the size of a snuff box, to be kept in a pocket. Often these were regarded as novelties, although with the benefit of hindsight it would be wrong to regard them as such. After all, Handel and Mozart wrote for pinned cylinder instruments; Haydn and Beethoven wrote for cuckoo clocks. Come the late 19th century, mass-market automated music devices had found their way into many wealthy American and European homes in the form of the player piano. Sophisticated devices combining the pinned cylinder technique with a pneumatic bellows system, they were programmable using perforated paper or metallic rolls (notably, the Welte-Mignon reproducing piano, which went to market in Germany in 1905, allowed musicians to “record” their performance for the very first time). Most who owned player pianos enjoyed them as a straight entertainment device, and they were all but killed off as a commercial product by the advent of the radio and the home phonograph in the 1920s and 1930s. But the instrument’s influence has persisted, perhaps because it could do things that human players could not. The player piano was the instrument of choice for Conlon Nancarrow, an American communist who travelled to Spain in the 30s to fight Franco, before relocating Mexico in the 1940s to pursue a unique vision of experimental composition. Nancarrow worked entirely on paper, laboriously punching out high-velocity compositions that smashed together boogie-woogie and ragtime with insane complexity and impossible time signatures. His work was for years overlooked, only getting proper respect in the 1980s following praise from another player piano aficiando, György Ligeti. Today, ensembles like Bang On A Can take a good swing at playing Nancarrow compositions live, but his further-out pieces, such as Study For Player Piano No 25, outstrip the ability of even the most skilled concert pianist by several orders of magnitude. 2012 installation Trimpin:(CanonX+4:33=100), which employed five deconstructed player pianos, triggered by a joystick-controlled RGB colour sensor that “reads” surrounding artwork. Trimpin has also worked on a macro scale: check out his If VI Was IX: Roots and Branches, a kinetic sound sculpture made of over 500 self-playing guitars, which can be found at Seattle’s EMP museum. When you envisage a mechanical orchestra, it’s these kinds of contraptions you think of: tinpot construction of gears and pulleys, whirring away untouched by human hand. If the earliest automated instruments appear to be examples of primitive programming, the mechanical orchestras that sprung up throughout the 20th century feel more like an attempt to harness and exploit randomness and chance. A key figure in the history of the mechanical orchestra is Pierre Bastien. 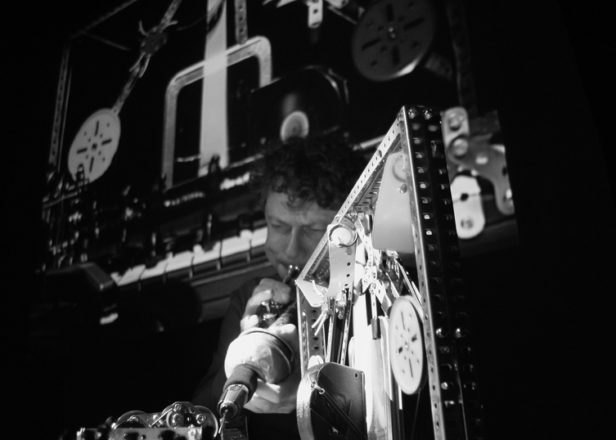 A former double bass player and veteran of the 1970s French counterculture, Bastien started in 1976 to build what he calls “Mécanium”, rickety musical constructions made from Meccano and conventional instruments – banjo, lute, Javanese saron – which resemble a particularly wild Rube Goldberg machine. The cranky and imperfect nature of Bastien’s machines is part of their appeal. “I like the way the machines don’t always play what I want. In fact, sometimes they play something better,” he says. “They escape the creator in a way.” And the results are as fascinating to watch as they are to listen to. A stylus drops on and off a vinyl record, revolving pin cylinders play a repetitive keyboard pattern, and household objects like combs or scissors are reconfigured as percussion devices. At the centre, we often find Bastien himself, jigging around with a trombone or a violin. Perhaps unexpectedly, Bastien talks of his music with reference to the loops and samples of contemporary dance music. “Many musicians don’t like to be asked to play the same melody or rhythm for 10 minutes,” Bastien told The Wire in 1998, adding that with the Mécanium, “I have 75 musicians who can play 75 loops.” Richard D James himself has cited Bastien’s work as an influence, and has released three of the French vanguard’s albums on Rephlex. While peculiar and often deeply individual, the creations of figures like Trimpin and Bastien tap into a rich history of 20th century experimental music. In these contraptions, you can see the influence of the intonarumori, the noise-generating devices conceived and built by the Italian Futurist Luigi Russolo between 1910 and 1930. Key too are the experiments in chance employed by John Cage and David Tudor. And it’s hard to overlook the influence of Alvin Lucier pieces like Music On A Long Thin Wire (1980) or Music For Solo Performer (1965), which reject the cold dead hand of the traditional classical composer in favour of playful experimentation, unlikely technologies, and the idea of sound as sculpture. In the latter piece, Lucier sits with EEG electrodes attached to his scalp, meditating until his brain enters an alpha state, triggering speakers that send vibrations through a number of percussion instruments. But while the likes of Cage and Lucier are now neatly installed in the canon, there is something about mechanical orchestras – and the mad scientists who engineer them – that resists absorption into the classical establishment. This is outsider art that often revels in its status as junk. The Montreal composer Maxime Rioux builds his “automates” out of familiar instruments – drums, cymbals, mandolins, banjos – linked together with discarded detritus such as wires, spools, corks, spindles and tin cans. Similar are the constructions of Michigan’s Frank Pahl, who specialises in “toy music” and automatic instruments. His more elaborate constructions are built from parts largely scavenged or sourced from flea markets: sewing machine treadles, toy pianos, bicycle parts, and empty propane tanks that double up as gamelan chimes. Rioux’s work nods to the Japanese concept of “ki”, or natural energy; both he and Pahl seek something holy in the embrace of chance, the beauty of their contraptions to be found in their unpredictable, tinpot nature. There is something in the idea of the mechanical orchestra that seizes the public imagination, and perhaps it is no surprise that these devices have been seized on by the corporate and advertising world. Unveiled at the Intel Developer Forum in San Francisco in 2011 was a robotic orchestra employing 2,300 rubber paint balls to play a 2,372 note composition – slick and ingeniously engineered, but next to, say, Bastien’s work, comparatively charmless. On a similar tack, the band OK Go have made big bucks combining music, corporate sponsorship, and Rube Goldberg-ian contraptions in the service of eye-wateringly popular viral hits. The march of technology is remorseless, of course, and as the mechanical orchestra intermingles with new inventions, fresh avenues for experimentation open up. Brighton’s Felix Thorn works between the advertising and the music world, building acoustic musical sculptures that feel like slick updates of Bastien’s work, and aim for a sound informed by the melancholy end of the Warp Records roster. The piece he exhibited at 2013’s Digital Shoreditch Festival, using a Microsoft Kinect motion sensor, is pretty neat. A good point, and perhaps if there’s a frontier here, it’s in these sorts of questions. Conlon Nancarrow’s work was once overlooked, barely considered music, but now there are ensembles dedicated to realising his compositions live. Modern feature films from Wall-E to Her to Ex_Machina invite us to empathise with robots. The music of the Berlin-based producer TCF feels hypnotic, immersive, melodic and composed – even though it is generated by algorithm. And as Moore’s Law pushes us closer and closer towards artificial intelligence, the lines are set to blur further. The questions keep coming. Could automated music conceive new ways for us to feel? Could a robotic 78-fingered guitarist teach a flesh-and-blood guitarist new techniques? Is the mechanical orchestra a novelty, or in their whirring gears and pneumatic movements, can we glimpse something of the future of music, waiting for our slow, mushy brains to catch up?